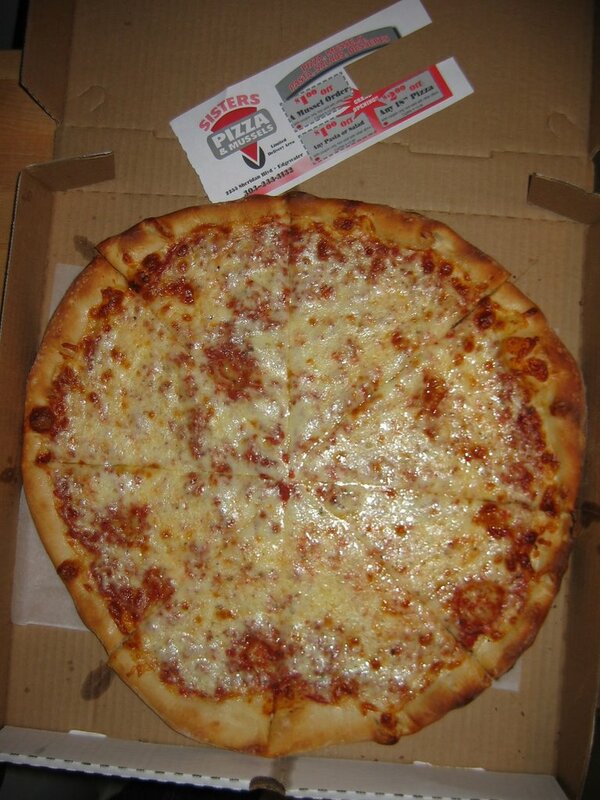 Style of Pizza: New York thin crust? Review: Sister’s is a fairly new restaurant opened in Denver’s Edgewater neighborhood, and overlooks Sloan’s Lake from across Sheridan Blvd. I believe it is the newest member of the Naples Group family, along with Heidi’s Brooklyn Deli, Soup-n-Juice, and Sushi Hai. 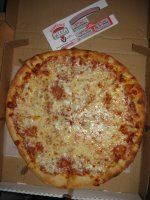 We actually didn’t go to the location, but rather ordered a 16″ cheese pie for delivery at the end of a hectic Friday afternoon. It took about 50 minutes from order to delivery. During the wait, Robin was heard to say, “this pizza better be good! Although I will probably still eat it if it isn’t.” That’s my girl!! By the time we got it on the table, the cheese had cooled and congealed into an elastic skin covering the pie. A brief reheat in the oven softened it up nicely and we found the flavor of the cheese to be OK – not awesome, but not all that bad either. 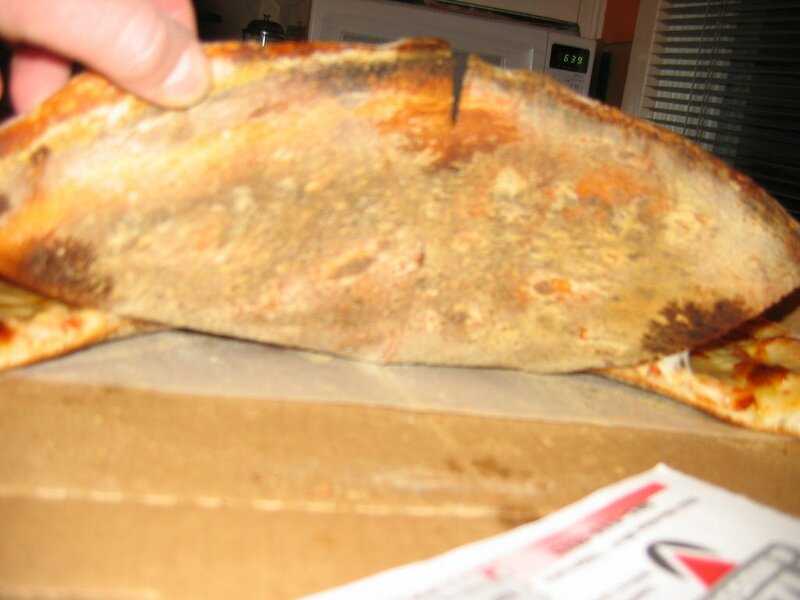 It clearly was a slightly better cheese than many discount delivery joints use. The pie was light on the tomato sauce, which had a weird, tapenade-like texture to it. It almost seemed like a course paste, but it didn’t taste very tomato-y either – somewhat salty without many herbs or sweetness. The crust was quite thin with a small lip, was foldable, and nicely charred on the bottom, although it was very lacking in flavor. I didn’t have a menu and I can’t find a web site, so I don’t know how they classify their pizza, but at first glance I would say it could fall into NY-style thin crust. I also know (based on a coupon) that the pies at least go up to 18″. For the sake of a complete review, I will stop by the joint someday and sample some za in-house (just don’t expect me to sample the mussels). I don’t think we will be ordering delivery from Sister’s again. This entry was posted in Forgettable, New York-Style, Thin Crust, Uncategorized. Bookmark the permalink. I think their pizza is better than that. Part of it could be the delivery delay, but that wouldn’t explain why you found the sauce lacking. I’ve always liked their sauce. (Maybe they’ve changed it since you tried it.) Please do try it again at the store. My friends and I have rated Sisters consistently high for pizza.